Skeptics of the policy have highlighted the potential for job loss among employees that a $15 minimum wage is designed to help. But Census Bureau data show that the policy faces a more fundamental problem: A majority of Americans in poverty don’t work, and thus won’t be affected by the raise. In a 2010 paper published in the Southern Economic Journal, economists from American and Cornell University examined poverty data from the 28 states that raised their minimum wages between 2003 and 2007. They found that these states saw no associated reduction in poverty from their higher wages. The authors attributed this to the fact that increases were not well-targeted to families in poverty. Recent Census data, for instance, show that over 60 percent of individuals in poverty don’t work. The Employment Policies Institute used data from the 2013-2015 March supplements to the Current Population Survey to study the working age population (18 to 64-year-olds).Living in poverty in each state. In 41 of the fifty states plus Washington D.C., more than 50 percent of the working age population living in poverty is not employed. This finding holds unique relevance for states that recently made the decision to adopt $15. 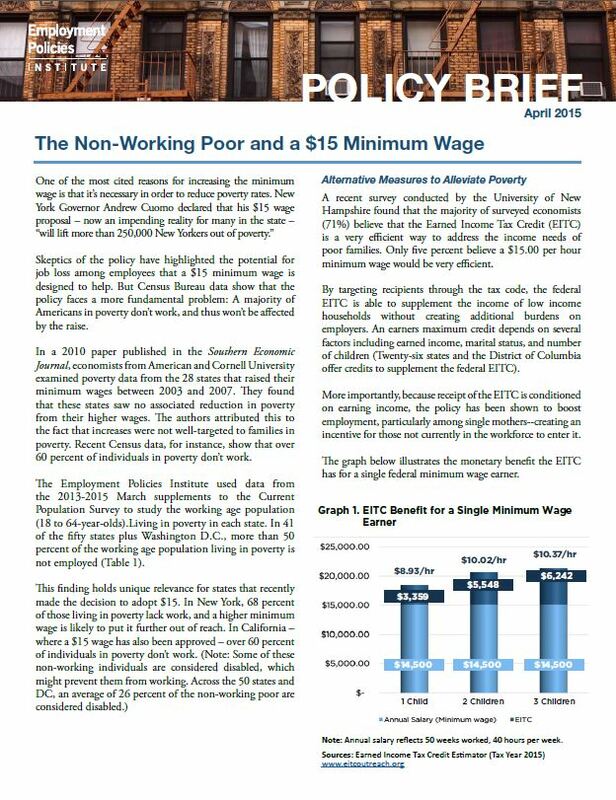 In New York, 68 percent of those living in poverty lack work, and a higher minimum wage is likely to put it further out of reach. In California – where a $15 wage has also been approved – over 60 percent of individuals in poverty don’t work.